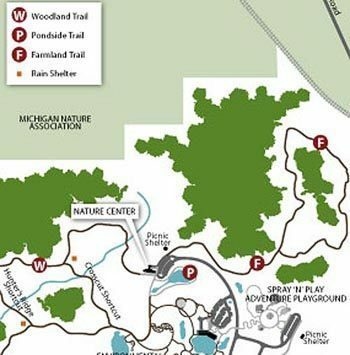 The Farmland Trail departs from the nature center and provides a leisurely hike to the east. Through in the beginning it briefly swings through the woods it soon breaks out into a tall grass prairie where the parks Spray N Play Adventure Playgournd is visible.Most of the trail is a 0.75 mile loop through old farm fields and past fencerows where during July and August field flowers can be enjoyed. At that time of the year this trail does not get hammered by insects like the Woodland or Hike-Bike Trails. The Farmland Trail departs from the nature center and provides a leisurely hike to the east. Through in the beginning it briefly swings through the woods it soon breaks out into a tall grass prairie where the park’s Spray N’ Play Adventure Playgournd is visible. 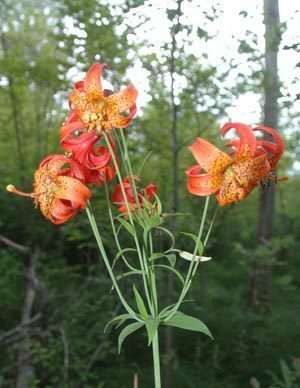 Most of the trail is a 0.75 mile loop through old farm fields and past fencerows where during July and August field flowers can be enjoyed. At that time of the year this trail does not get hammered by insects like the Woodland or Hike-Bike Trails.